Edmonton, Alberta – Not only did the Oilers welcome a new player tonight, they welcomed a new jersey. When the Oilers called Ryan Nugent-Hopkins’ name at the 2011 NHL Entry Draft in Minnesota, he was given the new Vintage Away jersey which the Oilers will now wear as their permanent road jersey. The Oilers' newest jersey is a reverse of the current home jersey which features the team’s vintage colours: orange, royal blue and white. "When we introduced the home vintage jersey in 2008, our fans told us they love the return of the retro Oilers colours," said Oilers President & COO Patrick LaForge. "We listened to our fans and know they will be happy to see the set complete with the new road vintage jersey." Tonight at the Oilers Draft Party presented by ATB Financial, one lucky fan, Jay Zaal, won the first Vintage Away jersey given out in Oil Country. "It's amazing that RNH (Ryan Nugent-Hopkins) was picked, and amazing that I'm the only other person wearing this jersey right now," he said. "It looks good and I feel good in it." The Oilers newest jersey means the current road jerseys will be retired and will soon become a valuable collector’s item. Limited quantities of the retired jersey are currently available at the Oilers Store and NHL.com for a short time. 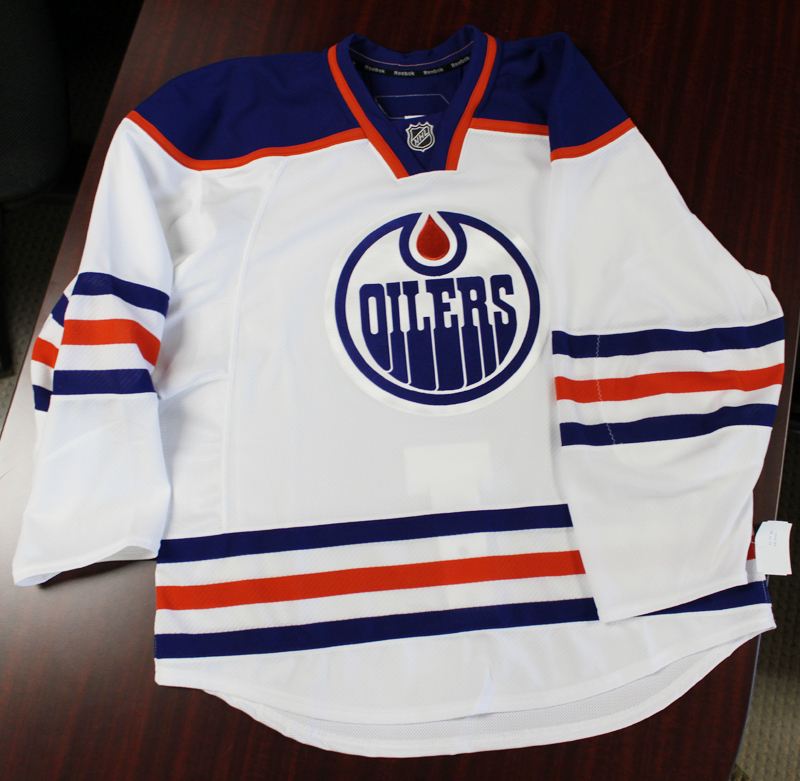 The new Vintage Away jerseys will be made available to fans later this summer at Oilers Store locations & NHL.com. To pre-order a Vintage Oilers Away jersey, visit the Oilers Store today or call 1-866-442-6966.